Credit Suisse is calling for the peak in global commodity demand due to their projections on China. The firm's argument focuses not just on China's slowdown but also on the shift in the nation's mix of growth sources. China is rebalancing its economy by moving away from export and infrastructure economy toward domestic demand, with a focus on household consumption. It's unclear just how successful they will be in that transition and how quickly they would be able to achieve it, but the nation's central planning will be steering the country in that direction. Such a transformation will in turn reduce China's demand for natural resources. Credit Suisse: As the economy shifts its growth engines away from infrastructure, construction and exports toward consumption, especially service consumption, the propensity of demand for commodities is bound to decline. Getting a massage simply does not use as much steel as building an airport. People often don't appreciate just how much of the commodity demand has been coming from China. Credit Suisse: China had a massive surge in its demand for commodities over the past decade, fuelled by its housing boom and infrastructure investment boom. From 2000 to 2010, China’s imports (in value terms) of iron ore surged by 42.5 times, thermal coal 248 times and copper 16.2 times. During the same period, its production (in quantity terms) for aluminium jumped by 441.8%, cement 219.5% and steel 396.0%. It is the biggest consumer in virtually all commodity categories in the world. 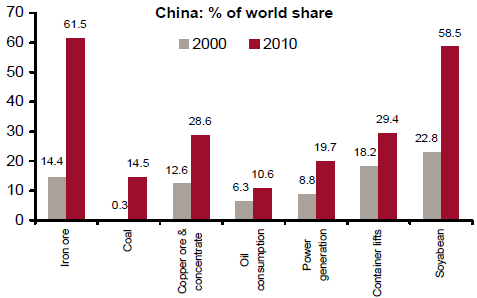 China was the key factor behind the global commodity supercycle, in our view. The chart below is a bit dated but it makes the point. When it comes to commodities, China has been in the driver's seat. A combination of reduced monetary stimulus and slowing GDP growth is expected to moderate China's demand for commodities. 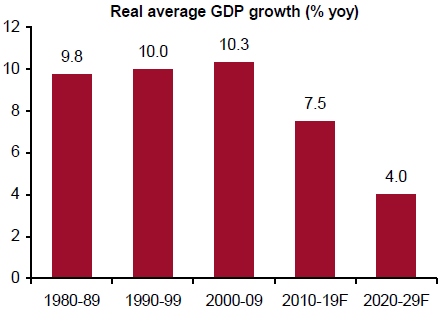 The chart below shows the long-term GDP growth projections for China. But beyond just the slowing growth, China's focus on infrastructure and exports required unsustainable amounts of natural resources for every point of GDP growth. With the structural shift in sources of GDP growth, these requirements should decline. Credit Suisse believes we have reached the peak for global commodity demand on the back of China's economic shift. 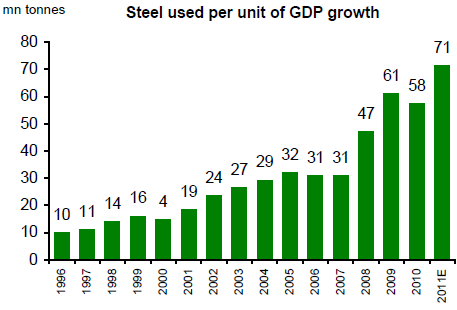 Credit Suisse: In 2011, it took 71 million tones of steel for one percentage point of GDP growth – that is unheard of in the world’s modern history. We project that the ratio should moderate to 30-40 million tones for every percentage point of GDP growth by 2020. There will be cyclical ups and downs, which may affect China’s demand for commodities and commodity prices, but we think China’s supercycle for commodities is behind us.